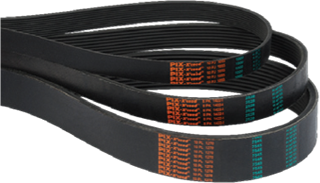 Poly-V belts are available in PH, PJ, PK, PL and PM cross-sections. All these belts will operate in standard polyvee belt pulleys provided they are manufactured to the DIN 7867 or ISO 9982 standard for the specific cross section. Polyvee Belts are marked with pitch length in mm, the section and the number of ribs. Static conductive undercord (ISO 1813) ensures safe operation. Less Noise, vibration and weight. Long life thanks to extra load carrying capacity.